"In 1899, the orig­inal [guilty verdict] is quashed and a new trial is held in Rennes. Bertillon, again, is one of the expert witnesses. His task has become more difficult, as he must now prove that the bordereau is not an undisguised note left by the sloppy spy Esterházy but the carefully designed product of Dreyfus's devious mind. Bertillon is up to the task. Apotheosis of Bertillon's system, the deposition runs for more than fifty pages of dense text, plus pictures and exhibits. Photograph of the bordereau dated Oct.
"Of that bordereau, Bertillon peruses every word, measures every letter, photographs every wrinkle. He sees patterns everywhere. When the thirteenth line of the bordereau is superimposed on the thirtieth, three letters are aligned. When the word intérêt is taken out and repeated and the two copies put end to end, they measure 12.5 millimeters, a unit size on military maps. Even more damning, a standard subdivision of this unit, 1.25 millimeters, is found every­where in the word: 'length of the t's cross: 3 [units of l.25 millimeters]; length of the acute accent: 1; width of the circumflex, one and a half, and height of the final t: 4, etc.' Coincidences? Impossible. 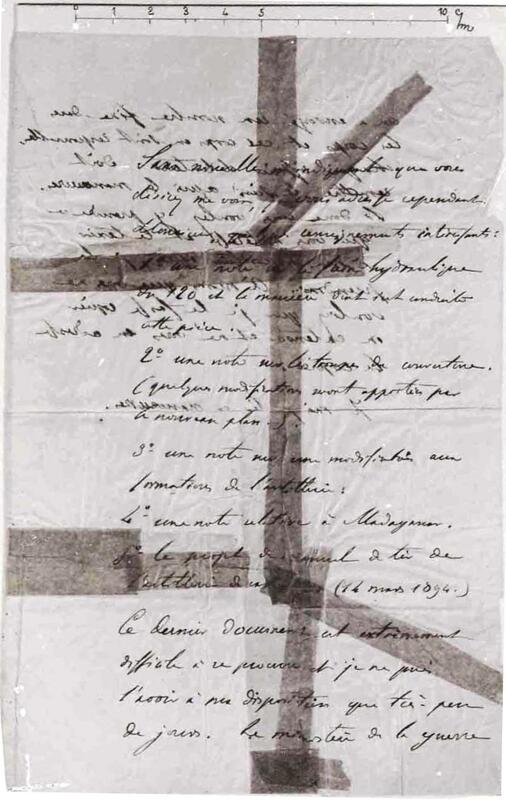 The bordereau must be the work of a master craftsman who used several templates and a military-issue ruler to create one of the most complex forgeries of modern times. "It is hard to tell how impressed the court is with Bertillon's arguments. In any case, the judges find Dreyfus guilty of treason once again, although with 'mitigating circumstances.' This nonsensical verdict reflects more the need to uphold the status quo than the merits (or lack thereof) of the case. Drey­fus's innocence is plain for anyone to see. Refusing to wait for yet a new trial that may never happen, Dreyfus consents to be pardoned by President Loubet on Septemher 19, 1899, at the cost of accepting the guilty verdict. He will have to wait seven more years for his final rehabilitation: being reinstated to his former rank in the army. but he invented the theory of "auto forgery"
"It would be easy to regard Bertillon as a madman -- many of his contempo­raries did. But that would overlook his otherwise successful professional career, how he rose through the ranks and devised new ways to catch criminals -- hardly what you would expect of a lunatic. And lest we feel too smug, every aspect of Bertillon's thinking has been reproduced in the labora­tory, showing how reasoning can lead everyone on the wrong track. 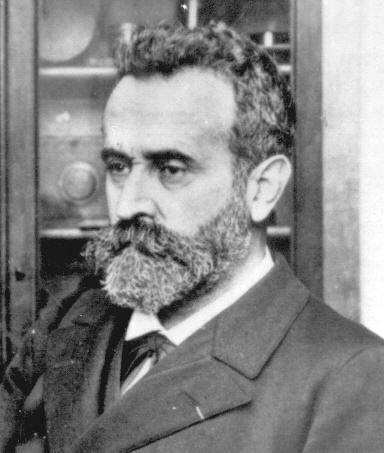 These experiments have replicated -- on a smaller scale, fortunately -- the mental processes occurring in Bertillon's mind. Unambiguously, they point to rea­soning as the culprit. "When Bertillon mentions the perfect comprehensiveness with which he embraces all the facts, he exhibits clear symptoms of overconfidence. According to the intellectualist approach, reasoning is supposed to make us doubt our own beliefs, especially when they rest on foundations as shaky as Bertillon's. How can reasoning lead to overconfidence instead?"